Scosche FlipPort-Friendly Bluetooth freedomMIC | OhGizmo! By Andrew Liszewski on 09/22/10 • Leave a comment! 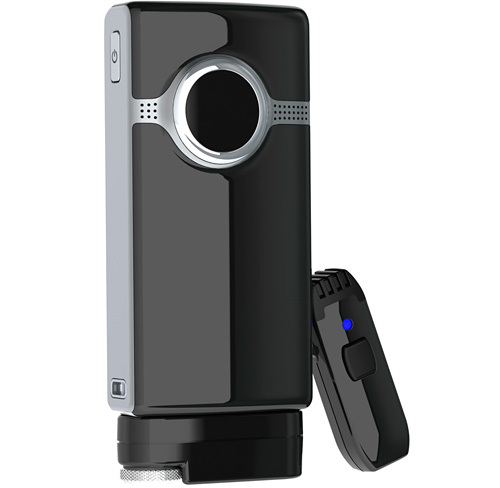 A couple of days ago Flip announced updated versions of their camcorders that include a new feature called the FlipPort. It’s a proprietary connector now found on the bottom of the Flip UltraHD, and eventually all of the Flip camcorders, that provides a way for accessories to ‘plug in’ to the camera. Thankfully instead of keeping it a secret from everyone, Cisco made sure that certain third-party accessory makers were aware of the new addition before it was announced. So over the past few days we’ve already seen a handful of FlipPort accessories revealed, like the new freedomMIC from Scosche that immediately improves the Flip which has only ever been able to use its own built-in mic for recording audio. Primarily designed for recording audio during an interview the freedomMIC is composed of a receiver that attaches to the FlipPort and a wireless “high performance” lavaliere-style condenser mic complete with DSP noise cancellation. It uses Bluetooth for a pretty decent range of up to 100 feet, and since the mic and receiver both have their own rechargeable lithium ion batteries good for about 4 hours, they won’t drain the Flip. (Does the FlipPort even provide power? I wonder…) Available mid to late December for $99.99.